Fisheries & Agriculture Job Circular:Ministry of Fisheries and Agriculture jobs for Field Assistant, Computer Operator, Cashier, Data Entry Operator position job circular has been published 9th August 2015 under the organization Ministry of Fisheries and Agriculture. A total 512 employees will be recruited through this circular. 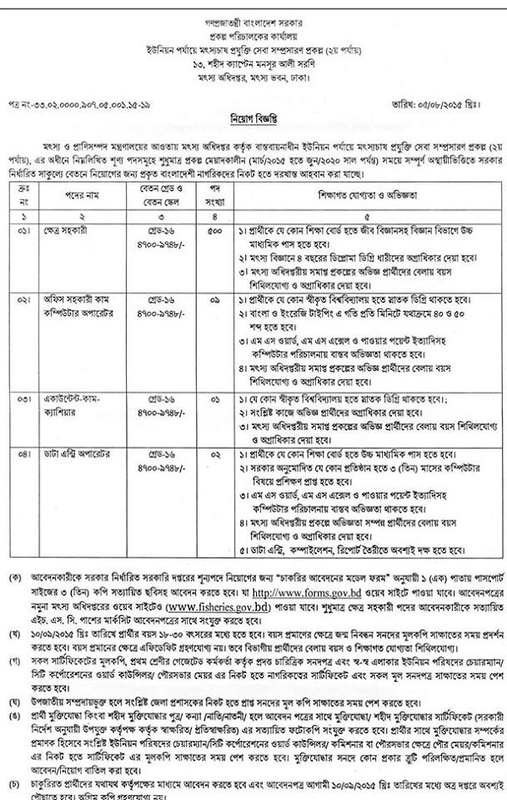 You can see details Ministry of Fisheries & Agriculture Job Circular 2015 here. For Field Assistant: Applied job seeker must be science background biology included higher Secondary passed. For Computer Operator: Job seeker must be Graduate from any Reputed University. Cashier: For this position applied seeker must be Graduate from any Reputed University. Data Entry Operator: Must be higher Secondary passed. Collect a model form which is found http://www.forms.gov.bd this website and attach 3 passport size Certified photo will be attached with the applied form. Those who applied for Field Assistant they must be attached HSC certified marks sheet with the application form. Job seeker must be 18-30 years old before 10th September 2015. Tribe and Freedom fighter job seeker will have to collect their certified Evidence before meet.